The defense for a former University of Virginia lacrosse player on trial for murder called its first witnesses Wednesday. 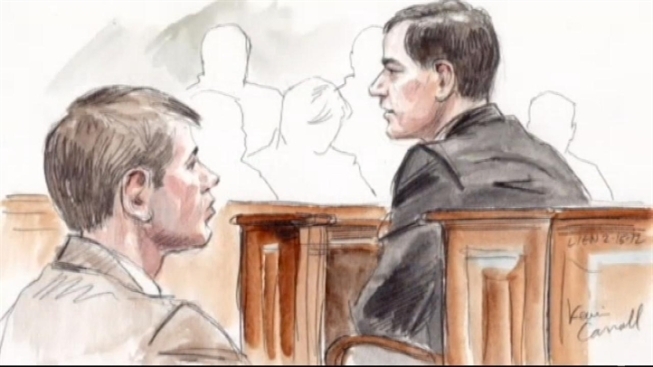 The defense began its presentation with a medical expert who said he believed Yeardley Love -- the ex-girfriend of the defendant, George Huguely, and a member of UVA's women's lacrosse team, was asphyxiated from lying face down in a damp, bloody pillow. The testimony did not state how she came to be in that position. "That could do it," Dr. Jan E. Leestma said of his pillow death theory. During cross-examination, Commonwealth's Attorney Dave Chapman sharply questioned Leestma and asked how much he was paid to testify for the defense. He replied $8,000. While Huguely acknowledged in a police interrogation that he and Love's final encounter turned physical, he said he did not believe her injuries were serious. He said she had a bloody nose. His attorneys have argued that her death was accidental, possibly the result of drinking and a prescription drug the suburban Baltimore woman took for attention-deficit disorder. A coroner has said those substances were in her body but not in potentially lethal doses. Another defense witness testified that Love's blood alcohol level was higher than recorded in an autopsy. Before the prosecution rested after lunch, several teammates and people who lived near Huguely testified about his behavior the Sunday before Love died. Ken Clausen, a lacrosse teammate of Huguely's and a pallbearer during Love's funeral, offered some of the most compelling testimony Wednesday morning. Huguely looked drunk all day May 2, Clausen said. Huguely was glassy-eyed during Sunday's father-son golf tournament and drunk afterward at dinner, Clausen said. Huguely's father, who was present at dinner, told him to stop drinking so much wine, Clausen said. He also said Huguely was upset after dinner about a graduation present. Clausen said he went to get beer around 11:40 p.m. and did not see his teammate Huguely until 12:15 a.m. He testified that Huguely acted strange when he walked back into the apartment, saying "he has a blank stare and said nothing." Clausen told the court he asked Huguely three times what was wrong. According to Clausen, Huguely replied, "Nothing," drank a beer, watched TV, and then went to bed. When asked to describe Huguely's drinking habits, Clausen said: "Ridiculous, he was belligerent." The court also heard from William" "Mikey" Thompson, who lived in the apartment across from Huguely. Thompson had been at the Sunday golf outing as well. He said Huguely had consumed three or four beers before the tournament's start and stuffed his golf bag with more beers before heading out on the course. Thompson told the court that at the club house following the tournament, Huguely was clearly drunk, telling "inappropriate stories," and after dinner, Huguely urinated on the side of a building. He testified that Huguely's drinking was "out of control" and that Huguely had a "lack of caring about things he should care about due to his excessive drinking." The night of Love's death, Huguely went into Thompson's apartment, used the bathroom for 10 seconds, looked into Thompson's bedroom and then went back to his own apartment, Thompson said. Huguely has pleaded not guilty to the murder charge and five other counts. He could be sentenced to life in prison if convicted of first-degree murder.